I’m looking for an 8 inch rabbit with a white face with a pink stitched mouth and nose. His hat is blue as is his bow tie. 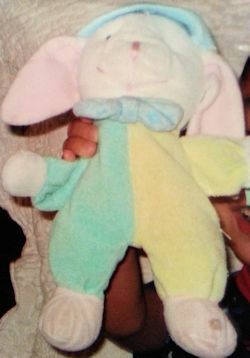 He has pink ears and the body is split down the middle, half yellow half green. It did not have a rattle. I don’t know anything else about this rabbit, but I would love to find him. He was Lost on an Amtrak train, and he was my son’s best buddy. It will be hard to track him down without additional details. About how big was he? Did he have a rattle inside? Thanks Plush Detective. The rabbit is about 8″ tall and does not have a rattle.